Being accused of drunk driving can be an emotional roller coaster. People are often ashamed of their bad judgment or angry that they were wrongly accused of a DUI. Many are worried about the potential consequences they may face, and the stress of facing the loss of their driving privileges, job loss and family scrutiny can seem overwhelming. At The Law Offices of Matthew D. LaTulip, P.C., we understand what our clients are going through when they face a DUI. We know that people make mistakes. We also know that people sometimes find themselves in the wrong place at the wrong time. Regardless of your situation, our Merrillville, Indiana, law firm provides criminal defense strategies designed to protect your freedom and your reputation. We focus on minimizing the consequences of felony and misdemeanor charges of driving under the influence, so that you will be able to put your DUI/DWI behind you and begin moving forward. You may have received a solicitation letter from another attorney, discussing the potential consequences of a DUI or an OWI conviction or promising certain results. At the Law Offices of Matthew D. LaTulip we believe that the consequences of faulty or cheap representation are too serious. We don’t scare people into seeking our representation, but rather are there for you when you need us and are ready to contact us to discuss your case. At The Law Offices of Matthew D. LaTulip, P.C., we believe that thorough preparation is critical to case success. We take a hands-on approach to your case. Your attorney personally meets with you, reviews the charges filed against you and explores all options to get the best possible results. 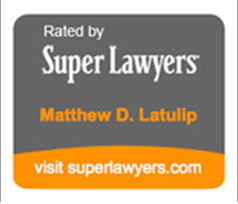 Matt LaTulip is an experienced trial lawyer who has successfully handled many DUI cases. His experience includes having been appointed and served as Judge pro tempore in the Lake County Superior Courts. During his service as Judge Pro tem, Matt came to understand cases from the other side of the bench. He uses his knowledge of the judges he worked with and their judicial perspectives to successfully represent his own clients as an attorney. If this is your first offense for DUI, you may face misdemeanor charges for operating your vehicle while intoxicated. OWI is a Class C misdemeanor in Indiana if your blood alcohol content is between .08 and .15. If you blow over .15, you may face a Class A misdemeanor. You will probably also be charged with Operating a Vehicle While Intoxicated Endangering a Person. This is also a Class A misdemeanor. The consequences of a drunk driving conviction can have a significant impact on your life. Prosecutors often threaten jail time, probation, fines, court fees and driver’s license suspension. At The Law Offices of Matthew D. LaTulip, P.C., in Merrillville, Indiana, our goal is to minimize these consequences. To do this, we look at the complete picture. For example, by pleading guilty to a criminal charge stemming from a drunk driving accident, you may be opening yourself up to the possibility of a civil lawsuit filed by an injured driver. If the driver were to win a lawsuit against you, you may face punitive damages that are not covered by your insurance or dischargeable in bankruptcy. This could become a larger problem than the DUI conviction itself. Felony DUI is usually charged when you are accused of OWI and have a prior OWI conviction within the last five years. It can also be charged if a minor is riding with you in the car. At the Law Offices of Matthew D. LaTulip, we take felony charges seriously and will work to protect your rights and interests. Charged With OWI /DUI Again? A conviction for a second drunk driving charge can lead to mandatory jail time. A Second charge if within five years of the first – is a felony. With every conviction, the penalties get longer and so do the driver’s license suspensions. Your rights remain the same. The Law Offices of Matthew D. La Tulip are here to protect them. We provide aggressive defense against charges of multiple offenses of OWI /DUI/DWI. On a second or subsequent OWI offense, (if charged as a Felony) you could be incarcerated from a minimum of Six (6) months and up to three (3) years, with an additional Ten Thousand Dollar ($10,000.00) fine. Even, as a misdemeanor, the State often charges a person with several different level offenses arising from the same incident (for example: OWI / DUI per se Class “C”; OWI/ DUI Endangering a Person Class “A”; OWI/ DUI with Blood Alcohol Content Greater than .15 BAC Class “A”) meaning that you could be facing up to One (1) year incarceration and Five Thousand ($5,000.00) fine on each Class “A” misdemeanor; and One Hundred Eighty (180) days and Five Hundred ($500.00) fine on the Class “C” misdemeanor for a total cumulative possible incarceration of two and one half (2 ½) years and Ten Thousand Five Hundred Dollar ($10,500.00) fine! Further, if you have another listed “major” driving offense as governed by Indiana Statutory Code, you could be adjudicated a Habitual Traffic Violator, being subject to a Five (5), Ten (10) year, or even Life time Driver’s License Suspension. Initial consultations and case evaluations by Attorney Matt LaTulip are at no obligation. They are confidential and free of charge on any case. To schedule your initial consultation, call us at (219) 756-7600 or complete our secure online contact form.